A Ghostbuster fan and longtime raver was arrested outside a Kentucky Fried Chicken over the weekend after someone mistook him for a gun wielding psychopath. 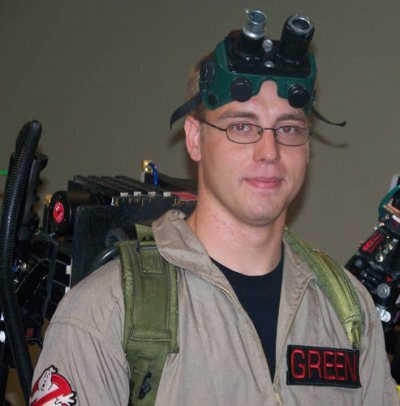 The raver in question, a 35 year old psytrance freak and cult 80s movie enthusiast, was dressed up in an authentic Ghostbuster outfit he had purchased off eBay. The outfit included a replica of the proton gun that the characters of the 1984 classic use to capture ghosts. This was not out of the norm for our geeky raver -- he is a dedicated cosplayer who spends most of his freetime dressing up as movie characters, cartoon characters, anime characters, and videogame characters. He's a role-play addict who has won several awards for his colorful and professional grade costumes. Unfortunately for our nerdy comrade, while he was trekking down the sidewalk in pursuit of a bucket of delicious fried chicken, a passerby saw him and confused his plastic proton gun for a real weapon. The police were called, and a nearby cruiser was on the scene within minutes. Just as our ghostbusting raver was about to satisfy his passion for poultry, he found himself the subject of a police assault. He heard someone shout at him, turned around, and found two officers, guns drawn, yelling at him to put down his weapon. At first he was confused and didn't realize that he was their target. It took him a few seconds and a few more shouts from the officers to realize what was going on. He tried to tell the cops that he wasn't armed and that his gun was just a toy, but they kept repeating their demands. The more he tried to talk to the officers, the angrier they became. Eventually, a crowd started to form, and our raver gave up any hope of getting through to the police. He put down his proton pack and was quickly tackled to the ground, cuffed, and thrown into the back of their car. Eventually the officers realized they had over-reacted, but it would be hours before our raver was free again. During the fracas the police managed to break his proton gun, and even though they were clearly in the wrong, they decided to charge him with public endagerment and disorderly conduct. It was only after he lawyered up and threatened to involve the news media that charges against him were dropped. The police, however, refuse to pay for his broken replica proton gun. He's bitter about what happened, but doesn't think suing the police would be worth the time or effort.